Skylight is a New Zealand organization that addresses children in stressful circumstances, such as those who have suffered natural disaster, loss of a loved one, domestic violence, bullying, trauma, etc. 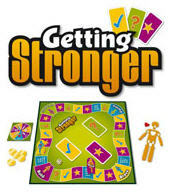 Their game Getting Stronger is designed to address these topics under the supervision of a professional support or social worker. The base game costs $65 NZ (about $48 US) and each pack of topic cards costs $10 NZ. It was designed by Tricia Hendry of Skylight with assistance from IQ Ideas.